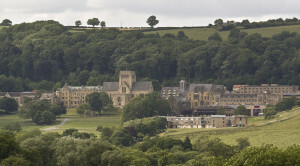 We had a wonderful day on the cider (tour) at Ampleforth, yesterday – the weather was just perfect for it. Warm sunshine, lovely views & autumnal colours. Tea, coffee or apple juice on arrival, an interesting talk in the orchards & so many varieties of apples to try if we wished. Amazingly the cider presses & bottling area took up little more than a shed the size of two double garages. Lunch consisted of broccoli & Stilton soup with a huge whole meal granary bread bun, followed by Yorkshire Tapas – ham, beef, pork pie, small sausages, gherkins, leaves, tomatoes & two types of cheese presented on a sharing board – all local produce & as much tea & coffee as required. Bottles of apple juice, liqueur & apple brandy were available at a discounted price after sampling all of these with lunch. Then it was on to the main building & Abbey for the rest of the afternoon. Thanks go to Ann Hill for continuing to provide a wonderful annual programme of days out. Thanks also to Tania Brightmore for her reports on our events. This entry was posted in Events, Reports and tagged Ampleforth, Forum days out on October 19, 2018 by admin.